Bing Ads is the online advertising platform that allows you to reach potential customers across the Yahoo! Bing Network and bring them to your website. Bing Ads allows you to create ads for your business that can display whenever a person conducts a relevant search on Yahoo! or Bing, or visits a site in their network. Keywords are the words and phrases you add to a campaign that trigger your ad to show. For example, if you deliver fresh flowers, you could use "fresh flower delivery" as a keyword. 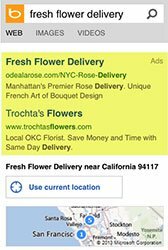 When someone searches Bing using the phrase "fresh flower delivery" or a similar phrase, your ad might appear along with the Bing search results. There's no minimum amount that you have to spend in order to show your ads on Bing. You set an average daily budget for your campaign along with a bid for each of your keywords. Every time someone searches on Bing, Bing Ads runs an auction with these bids to determine which ads show on the search results page. This also determines their rank on the page. With Bing Ads, you bid for each time a person clicks your ad. This is known as a CPC, or cost-per-click, bid. The amount you're charged per click depends in part on the maximum CPC bid you set. Generally, this represents the highest amount that you'll ever pay for an ad click. And since this is an auction, you'll only be charged the minimum amount necessary to keep your ad at its position on the page. 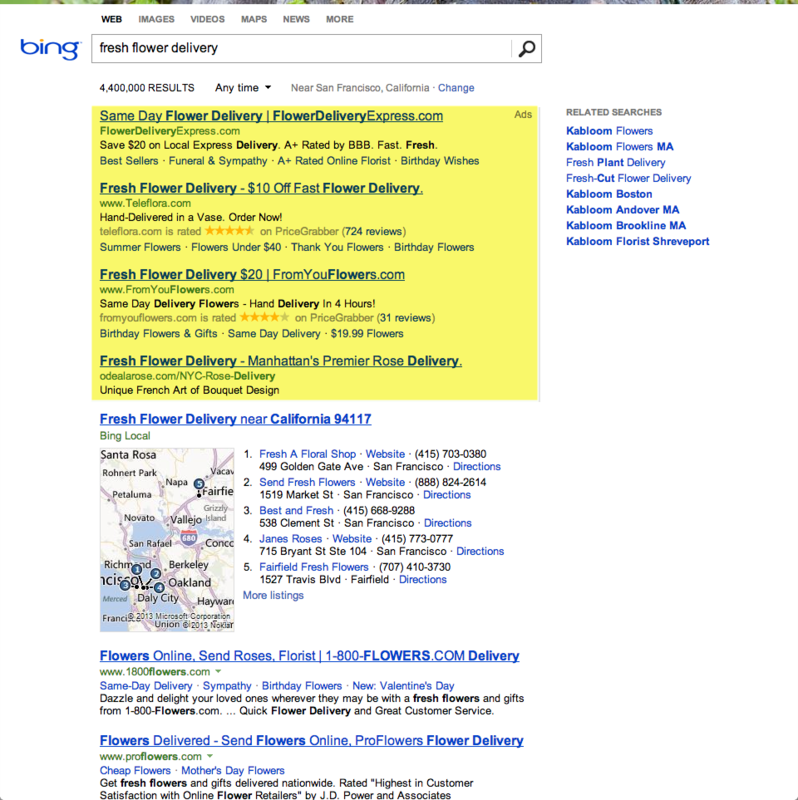 With Bing Ads, your ads can appear across Bing and Yahoo! owned and operated sites, their syndicated partner sites, Windows 8 Smart Search results, and across computers, tablets, and mobile devices. Near a particular business, landmark, zip code or coordinates. Bing Ads also lets you target locations you specifically want to exclude from seeing your ads. You may also choose the when your ads display. For example, you may only want your ads to run during your business hours. Or you find that your click-through rate and conversion rate are highest during certain times. You could then target Monday through Friday from 8:00 AM to 7:00 PM to show your ads when your potential customers can take action. If your typical customer skews heavily toward an age group, or your products are made specifically for one gender, you can use demographic targeting to reach them without wasting your ad spend on others. You may also target by device and choose to show ads to potential customers when they're using computers, tablets, smartphones or other mobile devices. Your budget is your daily spend limit for a campaign, so it should be an amount you'd be comfortable spending per day. Your ads are also shown evenly throughout each day with the standard daily budget. There are also two other budget options: daily accelerated and monthly. Daily accelerated will spend your daily budget as early in the day as possible and monthly will spend your daily budget as early in the month as possible. If you’re on a limited budget, you should stick with daily standard. Ad groups are containers that hold a set of ads and the keywords that trigger those ads. They also contain a default bid for keywords in the ad group along with keyword-level bids, if specified. Since ad groups live in larger campaigns, they inherit the settings and ad extensions from the campaign they’re housed in, though you can also apply unique settings and extensions to the ad group. Learn How to Use Ad Groups to Build Relevant Ads. Each text ad consists of a headline, some text describing your business, and a clickable link to your website. The first line of your ad is the one that customers are most likely to notice. Consider including your keywords in the headline to make it stand out because people are more likely to notice headlines that match what they're searching for. Your headline can contain up to 25 characters. These is where you describe the product or service you're advertising. Space is limited, so choose your words carefully to highlight the most important details and benefits. Bing Ads allows up to 71 characters for the description. This line of your ad shows the address of the website that you're promoting. Bing Ads lets you select a display URL to give people who see your ad a clear idea of where you’ll take them when they click on the ad. This does not need to match the actual URL you send people, so you may want to be creative. This is the precise location on the website the person who clicks on your ad will be sent. People will not see the destination URL, they will only see the display URL until they click your ad. Selecting the right keyword list for your campaign can help you show your ads to the right customers as they search or visit certain websites. The keywords you choose should match the terms your potential customers would use to search for your products or services. When you add each keyword to your campaign, you may also decide how much you're willing to pay whenever a customer’s search matches that keyword and clicks your ad. This is your keyword's maximum CPC bid. There is no automated bidding option with Bing Ads. And yes, you can still use Google’s Keyword Planner to discover keywords for Bing Ads. 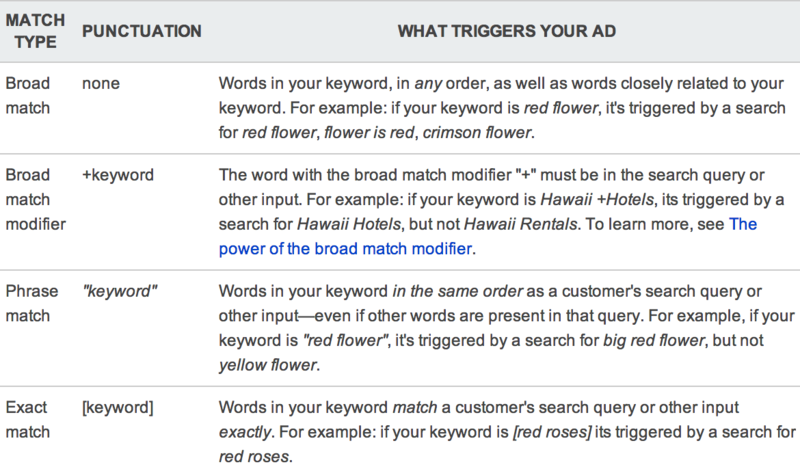 Match types give you control over how closely searches must match your keywords to trigger your ads. They’re an additional layer of control over your keywords that let you target the searcher’s intent. Learn more about match types here. You can lower your bids to reduce the average cost per click. Ensure your campaign is set to "Daily - Standard" instead of "Daily - Accelerated” or “Monthly." This ensures your budget is spread out throughout the day rather than spending as early in the day or month as possible. To optimize your ads, try out different ad text to see which ad has the best results. For example, duplicate your first ad and change the headline to see if that works better. When you find a winner, you can test variations of that ad and pause all the others. You can improve your results and lower your costs by adding, changing, or deleting keywords, match types and bids. For example, if your campaign has been running for a while and your performance data shows that some of your keywords are performing better than others, you could increase your bids for keywords that convert to sales and decrease bids for keywords that aren't converting to sales.